Some while ago I stumbled across a site that has pdf's of a whole bunch of Beatles legal documentation. It slipped my mind for some reason. I was reminded of it today when making a response in another thread. I thought they may interest a few people, and so here are a couple of links, along with a list of the links they have. Not sure this will cause much discussion, but there's some interesting stuff there. Really interesting! I was just reading about this in Lewisohn and this handy outline gives you some idea of how terrible the contracts were. The way Capitol/EMI operated really stuffed things up. And also this article about Beatles sales by the same guy. A 1977 document that settled a lawsuit between the Beatles and Allen Klein and also ended Klein's stormy association with the Beatles is being sold by Moments in Time, the company has announced. The asking price is $95,000. I can't remember the precise details about this, but I know it was Alexis Mardas's (Magic Alex's) refutation of some claims in the NYT. IIRC he was taking legal action against them at the time for describing him as something of a fantasist. It's really interesting for throwing some light on the Apple Electronics and Maharishi episodes. 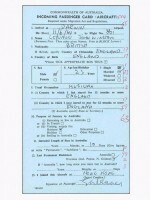 The National Australian Archive, which is in the process of moving (apparently), has saved its most valuable documents until last, and as part of the news that the documents are now being moved, they have published one of particular interest - John's entry card for the 1964 tour. I got exited at first when I saw the date the form was completed. "It was on my first birthday! ", I thought. Then reality set in when I remembered that they toured Australia in early June and Brits write dates incorrectly*. *Just kidding, guys. I don't want to start a debate with people who drive on the wrong side of the road. RN, you are correct that the mistake in box 7 is funny. Thanks for posting it. Yeah - sounds like I was causing trouble and was "exited" from the club. I'll rest easy knowing the Spelling Police are on duty. @parlance YOU'RE BACK (sorry I saw you viewing this thread). Also anyone who wants to see Beatles' legal documents as a business student I have access to all documents created by registered companies in the UK and Ireland, so if you want to see a specific company for a specific year, go ahead and ask. It's a miracle, parlance is displayed as online! How exciting to see this piece of history alongside a copy of the Declaration of Independence and Shakespeare.